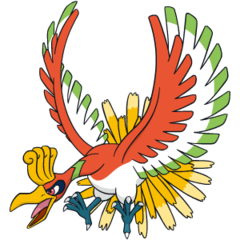 Ho-oh does not evolve/is not evolved into. X A legend says that its body glows in seven colors. A rainbow is said to form behind it when it flies. X Sein Körper soll in sieben Farben leuchten. Im Flug zieht es einen Regenbogen hinter sich her. X Son corps brille des sept couleurs de l’arc-en-ciel, arc-en-ciel qui se constitue derrière lui quand il vole. X Cuenta la leyenda que brilla en siete colores. Dicen que deja un arcoíris tras de sí al volar. X Narra la leggenda che il suo corpo brilli di sette colori. Volando lascia un arcobaleno dietro di sé. X 몸은 일곱 빛으로 빛나고 날아간 자리에는 무지개가 생긴다는 신화 속에 남아 있는 포켓몬이다. Y It will reveal itself before a pure-hearted Trainer by shining its bright, rainbow-colored wings. Y Es wird sich dem Trainer offenbaren, der reinen Herzens ist, und ihm seine bunten Schwingen zeigen. Y Il ne se montre qu’à un Dresseur au cœur pur en dévoilant ses magnifiques ailes colorées. Y Se revelará ante Entrenadores de corazón puro mostrando sus brillantes alas arcoíris. Y Può mostrarsi a un Allenatore puro di cuore spiegando le ali, che hanno i colori dell’arcobaleno. Y 마음이 올바른 트레이너의 앞에 무지개색의 날개를 빛내며 모습을 드러낸다고 전해진다. Omega Ruby Ho-Oh’s feathers glow in seven colors depending on the angle at which they are struck by light. These feathers are said to bring happiness to the bearers. This Pokémon is said to live at the foot of a rainbow. Omega Ruby Ho-Ohs Federn leuchten in sieben Farben, je nachdem aus welchem Winkel das Licht auf sie fällt. Die Federn sollen ihrem Besitzer Glück bringen. Dieses Pokémon lebt am Fuße eines Regenbogens. Omega Ruby Les plumes de Ho-Oh brillent de sept couleurs selon l’orientation de son corps par rapport à la lumière. On raconte que ces plumes portent bonheur. On dit aussi que ce Pokémon vit au pied d’un arc-en-ciel. 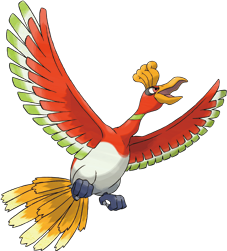 Omega Ruby El plumaje de Ho-Oh contiene siete colores que pueden apreciarse según el ángulo desde el que les dé la luz. Dicen que sus plumas dan felicidad a quienes las llevan y, también, que este Pokémon vive a los pies del arco iris. Omega Ruby Il piumaggio di Ho-Oh brilla in sette colori a seconda dell’angolazione dei raggi luminosi. Si dice che le sue piume portino felicità a chi le possiede. Si narra che viva ai piedi di un arcobaleno. Omega Ruby 빛이 닿는 각도에 따라 일곱 빛깔로 반짝이는 깃털은 행복을 가져다준다고 한다. 무지개 끝에 산다고 전해진다. Alpha Sapphire Ho-Oh’s feathers glow in seven colors depending on the angle at which they are struck by light. These feathers are said to bring happiness to the bearers. This Pokémon is said to live at the foot of a rainbow. Alpha Sapphire Ho-Ohs Federn leuchten in sieben Farben, je nachdem aus welchem Winkel das Licht auf sie fällt. Die Federn sollen ihrem Besitzer Glück bringen. Dieses Pokémon lebt am Fuße eines Regenbogens. Alpha Sapphire Les plumes de Ho-Oh brillent de sept couleurs selon l’orientation de son corps par rapport à la lumière. On raconte que ces plumes portent bonheur. On dit aussi que ce Pokémon vit au pied d’un arc-en-ciel. Alpha Sapphire El plumaje de Ho-Oh contiene siete colores que pueden apreciarse según el ángulo desde el que les dé la luz. Dicen que sus plumas dan felicidad a quienes las llevan y, también, que este Pokémon vive a los pies del arco iris. Alpha Sapphire Il piumaggio di Ho-Oh brilla in sette colori a seconda dell’angolazione dei raggi luminosi. Si dice che le sue piume portino felicità a chi le possiede. Si narra che viva ai piedi di un arcobaleno. Alpha Sapphire 빛이 닿는 각도에 따라 일곱 빛깔로 반짝이는 깃털은 행복을 가져다준다고 한다. 무지개 끝에 산다고 전해진다. Gold Legends claim this Pokemon flies the world's skies continuously on its magnificent seven-colored wings. Silver A legend says that its body glows in seven colors. A rainbow is said to form behind it when it flies. Stadium2 Legends claim this Pokemon flies the world's skies continuously on its magnificent seven-colored wings. Ruby Ho-oh's feathers glow in seven colors depending on the angle at which they are struck by light. These feathers are said to bring happiness to the bearers. This Pokemon is said to live at the food of a rainbow. Sapphire HO-OH's feathers glow in seven colors depending on the angle at which they are struck by light. These feathers are said to bring happiness to the bearers. This POKeMON is said to live at the foot of a rainbow. Emerald Its feathers--which glow in seven colors depending on the angle at which they are struck by light--are thought to bring joy. It is said to live at the foot of a rainbow. Diamond Its feathers are in seven colors. It is said that anyone seeing it is promised eternal happiness. Pearl Its feathers are in seven colors. It is said that anyone seeing it is promised eternal happiness. Platinum Its feathers are in seven colors. It is said that anyone seeing it is promised eternal happiness. HeartGold Legends claim this Pokémon flies the world’s skies continuously on its magnificent, seven-colored wings. Black Its feathers are in seven colors. It is said that anyone seeing it is promised eternal happiness. White Its feathers are in seven colors. It is said that anyone seeing it is promised eternal happiness. White 2 Its feathers are in seven colors. It is said that anyone seeing it is promised eternal happiness.